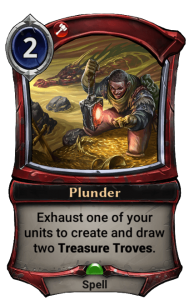 0.0 – Completely unplayable in a main deck; might have market use if you draft a merchant. 1.0 – Will always do SOMETHING, but is generally niche or just plain overcosted. 1.5 – Extremely mediocre filler. Something you’re unhappy to wind up playing, but will sometimes have to. 2.0 – Filler. Your deck will have a few of these, but hopefully not too many. 3.0 – Stronger playables. Not enough to perhaps draw you into the faction, but cards you are happy to wind up playing in your final deck. 3.5 – Very strong, efficient playables. You won’t have tons of these, but they represent a strong pull into their faction. 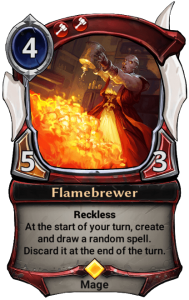 4.0 – Bombs or cards that warp the game around themselves, but are still answerable if your opponent has the right cards. 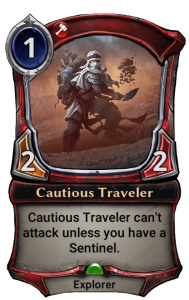 4.5 – Cards that are nearly impossible to beat if you draw and play them, but that come with some caveat (usually their cost). 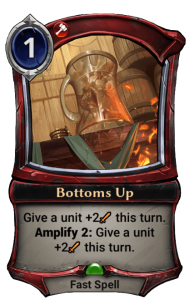 These almost universally generate card advantage or an absurd tempo advantage, and there’s nothing your opponent can do about it. 5.0 – Cards that are basically impossible for the opponent to answer cleanly, will win the game on their own, and aren’t prohibitive to play in any way. It’s extremely rare for a card to be a 5.0, and that’s a good thing, because they aren’t any fun to play against (looking at you, Pack Rat). BA – Build-around. These are cards that are clearly meant to be played only when you have the right synergies, and their power level will vary wildly as a result. 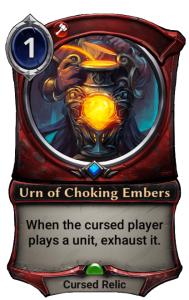 Obviously every card can be more or less powerful depending on your archetype (aggro vs. midrange vs. control) or the other cards surrounding it (your 10th 3-drop isn’t going to be that good), so the grades are meant as a guideline, not a hard rule, and you should really be looking at the comments on each card rather than the hard number grade. The fact that we have to adjust our views on cards based on context as the draft progresses is what makes drafting so interesting. I do want to preface this and all of my set reviews with the fact that I’m a filthy casual. I don’t devote tons of time to grinding card games anymore, but that just means that I try to play at the highest level possible when I do find the time. If I only have an hour to play, I damn sure want to win if I can, or revel in memes if I can’t. That does color my reviews a bit. I may be off on some cards due to lack of experience or desire to meme, though I hope that I at least do a decent job justifying the line of thinking that leads me to particular grades. I might have a meltdown if I had to play this. Unless you’ve got a merchant, there’s no reason to take this. It doesn’t matter how little spells like this cost; they are just too situational, and this one can’t even blow out a combat because it isn’t fast. Ordinarily, a trick that doesn’t give some form of survivability would never get a 2.5 grade, but the fact that this can double as a fireball-type effect to end the game out of nowhere means the first one is very good, and I’d probably play multiples in a sufficiently aggressive deck, and it may be closer to a 3.0. 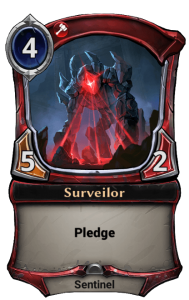 This is marginally playable, particularly in a deck that wants to blunt early aggression, but there just aren’t enough cheap sentinels to make this any more than a blocker. I was one of these not so long ago, but I hope I was a bit more useful. 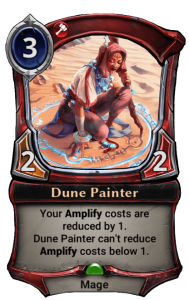 This is a fixer if you’re desperate, but a 1/1 just is too low impact to make the cut most of the time. 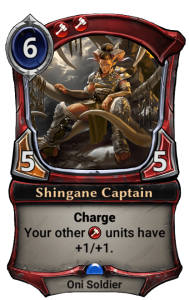 You can deploy something big a turn early, but you probably want to get more than a single turn’s advantage for the cost of a full card. If you do open some sort of insane bomb like Zal Chi, this does look a little more attractive, since it can both help you hit the influence and also hit the 7-power requirement, so that is worth keeping in mind when making garbage-time picks. In my limited experience so far, this has been pretty strong. 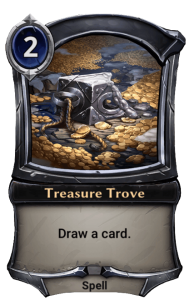 Again, it’s a low-impact card at the base rate, but there are quite a few tricks that give +3/+3 or better, so if you can trade said combat trick for an opposing 4/4 and get a treasure trove out of the deal, you’ve done well. This might have use in the most aggro of aggro decks, but probably belongs in constructed, if anywhere. 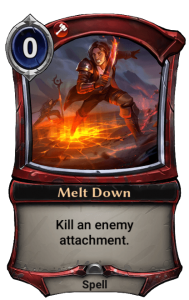 Most limited decks can’t leverage a single exhaustion that well, and it’s not worth a whole card. This is a very efficient removal spell with 2-for-1 potential if topdecked late. Don’t hold it unless you have good reason, but sometimes you’ll get two things, and that nudges this up to 3.5. This is a great topdeck later in the game, and could reach 3.5 if the format is vulnerable to 1/1s. Early in the game, it’s fairly mediocre, but I like the flexibility to play it on 4 or 6 if you have nothing else to do. Individual 1/1s are fairly weak, but a swarm of them can be enough to get around blockers to deliver a finishing blow, or to chump in a tight race. A 2/1 can at least trade for something small a lot of the time, and you aren’t forced to renown him if you think it’s too risky. However, you will sometimes have draws where this thing just attacks for a billion on turn 3 or 4. Even if they manage to kill him, if you can get far enough ahead, they won’t have time to leverage their extra cards. This is a pretty sweet common, especially if you can get multiples going (or just other Renown units) since triggering the first one will provide you fuel to keep the chain going. Heavy Axe is a nice weapon to have when you are in the middle developing stages of the game, since your curve won’t always line up perfectly, and you can find a spare power to slap it on an attacker. I’m a huge fan of this card. This is a neat idea, but it’s just too costly for too little effect. You have to pay 6 to draw a single extra card, and you also need to sacrifice an attack/block, which isn’t trivial. I’d stay away from this. This is the most obvious build-around of the set. A 3-power 2/2 isn’t good enough to play on its own, but once I have 3 or 4 Amplify effects, I’m going to look harder at this. 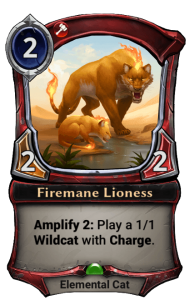 It’s pretty nutty with Bottoms Up or Firemane Lioness, to name a few. If you see this across the table, prioritize killing it. 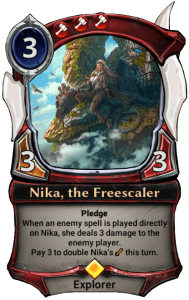 Pledge is a minor upside, but enough of one that I’d be a little happier playing this in a slower deck where a 3/1 for 3 wouldn’t ordinarily make the cut. I don’t think this is very good. 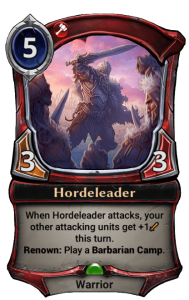 Charge on a 3-cost weapon is somewhat odd, since it seems to be asking you to play it on a newly-summoned unit, but that unit isn’t going to be very big if you also need 3 left over to play this. And this doesn’t make the unit sufficiently bigger that it will often enable an attack that you wouldn’t otherwise have had. 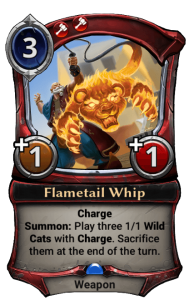 The three cats are a couple free points of damage, but without some kind of way to buff the cats (Xenan Obelisk) or some kind of synergy that cares about your units dying, I’d avoid playing this. It does a lot of things, but none of them really seem good enough. This asks a lot of you. 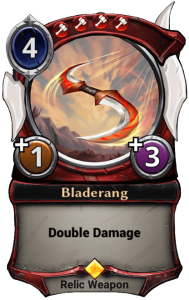 Paying 3 each time for a measly +1/+1 is not great, even if it is somewhat repeatable, but if you have enough good renown effects, this could make the cut. I would hesitate to play it with only 3 or 4 Renowns, but if you have a higher density, you can give this a whirl. A 3/3 for 3 is baseline decent, and the incidental upside of a 1/1 with charge is not irrelevant, especially in a race situation. 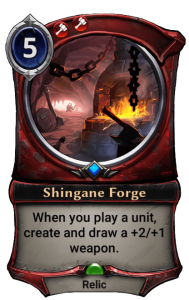 This card is obviously very efficient, but that is blunted by the FFF faction requirement. In a 3-faction format, this is never coming down on 3, and it’s unlikely even in a 2-faction deck. Still quite playable, but don’t treat her like a 3-drop and definitely don’t be afraid to pledge her if FFF looks like it’s a long way off. A 4/4 flyer is no joke. While this one may be expensive to maintain, the upside is that it isn’t vulnerable to slow removal. 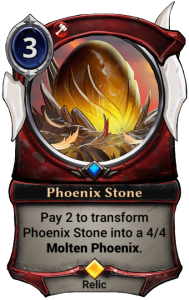 Phoenix Stone also gives you relic synergies, if you care about that. Put all that together, and you’ve got a very nice clock. 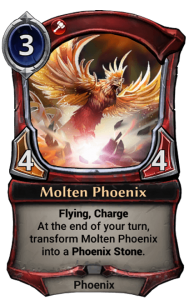 I’m unable to process why we’d want this in a limited deck (or a constructed deck, really, given Combustion Cell exists). 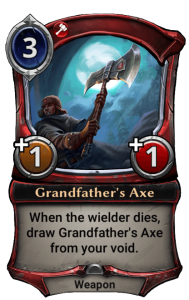 What a sick concept to have wasted on a basically-unplayable card. 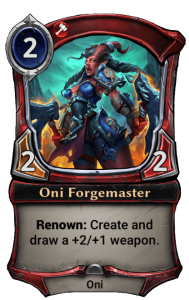 Maybe there’s something you can do in constructed with this thing, but FFFF is just too much for what amounts to a “2”/3 weapon. 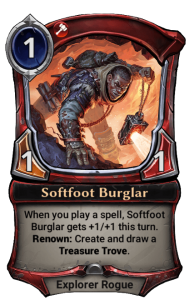 This can be card advantage, but it’s very conditional, and expensive even when it works, costing 6 total power to get ahead. I might play one of these, but I wouldn’t load my deck down with clunky, weak removal. I love amplify/kicker cards like this. The base rate is fine enough, if unexciting. At least you won’t be actively losing tempo if you play this on 4. But if you draw it late, it can turn a stalled board into a win, and that’s exactly what I want out of a flexible card like this. The base rate on this is too poor, and the upside very minor. 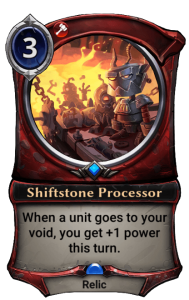 You’re never turning a profit in terms of power off this, so you have to be using it to generate tempo by playing multiple cheap things. The issue is that you already lost tempo by playing a 4-cost 2/2. 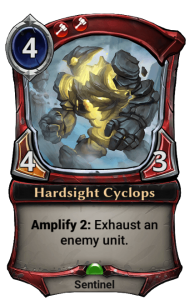 This is much better than Hardsight Cyclops (as I hope a rare would be), as the card advantage potential is very attainable. Win a combat with a trick and take out another unit. Note that his burn can also go upstairs. In one of the few drafts I’ve played, I died from 13 to an Aerialist’s Khopesh on this guy. 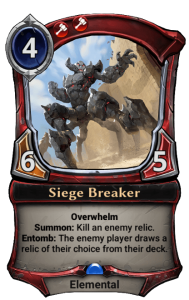 This thing is a potential game-ender, especially if you have a trick or weapon to blow out an opponent trying to set up blocks. 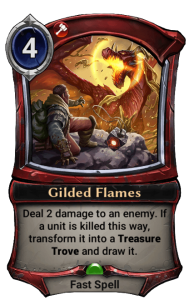 Not everyone will have many relics to go get, and those who do are also likely to have one in play. If you do manage to snipe one on the way down, you’ve done well. Even if they have something to get, I like this guy because he demands they have an answer, and fast. 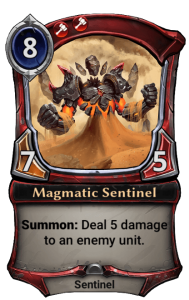 Unlike Refracted Sentinel from Fall of Argenport, which was a similar concept, this doesn’t give them value up front; they have to kill it first, and that’s the difference between a medium card and a very good one. This might do something, but you have to pay eight to get the first ping. If you desperately need relics for some synergy, I guess this serves, but I’d stay away without some very good reasons. I’m not a fan of low-health units this high on the curve. Pledge is an upside that is tough to evaluate, as it’s very contextual on how many Pledges you have in your deck. Still, a 5/2 isn’t unplayable, it’s just below the bar. If you can make it trade for something big, it can still put in work for you. Just let it be one of the first things on your chopping block. 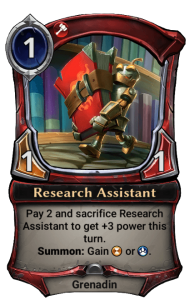 I put the question mark there because this looks like something that is supposed to be a build-around type card, but I’m really not sure exactly what it’s supposed to do. 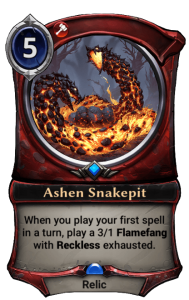 It costs 5, so you won’t get a snake before turn 6. They’re reckless, and they can’t block, so a single 1/4 bricks your entire game plan. And you’re only going to have so many spells…I just don’t see it fitting in any archetype. It’s probably safe to treat this as a 0.0 and move on. This bonus is temporary and it doesn’t buff himself, so any 3/4 just eats him. If you are going sufficiently wide (or have some Firemane Lionesses), that one punch can be enough. Barbarian Camp is a decent upside to get if you renown him, which can also help him get more attacks in. This seems like a very swingy play, but it’s extremely bad if you’re behind, which limits its potential in a highly-contested 5-slot. If I’m going to play a 5-mana do-nothing relic, I’ll play this one over the Snakepit. For one, your deck will have way more units than spells. 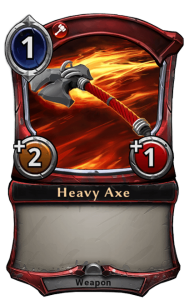 For two, a Heavy Axe is probably a better card than a Flamefang in a vacuum. It’s not free (you have to pay 1), but the axe triggers renown and, more importantly, is stackable if your opponent has a big blocker in the way. 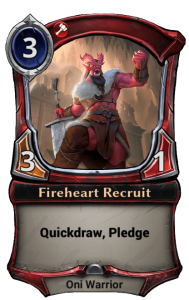 I would not draft more than one of these, howver. This is technically removal, but it’s quite poor removal. It’s 6 power for 4 damage that likely deals you some damage as well. Oof. You’re almost never buying it back in your average limited deck. As a fan of spell-heavy decks, I hope I draft a deck where this is playable, but I doubt I will. The cycle of captains are very powerful. This one does exactly what Fire wants, acting as both an anthem and a surprise charge curve-topper. You don’t get to play many 6-drops, in beatdown decks but this is a shoe-in for one of those slots. 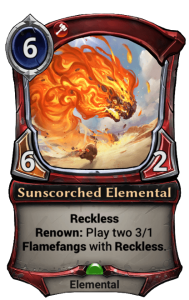 Speaking of scorching-hot 6-drops…this isn’t one. 2 health just means it walks into any old dork and dies. 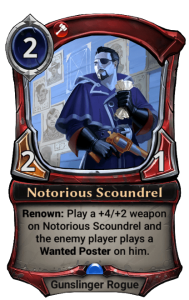 Even if you manage to renown it, it’s still not going to be that hard to trade with, and while the 3/1s can dish some damage, you are taking a huge risk when including this card in your deck. It’s not worth it when there are so many stronger 6s out there. As with all 6+ drops, you should remember that you only get to play so many. Will this be the best of your 7-drop options? Not often, but it’s playable if it’s all you have. It’s not the most spectacular 7-drop, but it’s there if you want one, and Pledge gives it some minor flexibility. Because this costs 7FFF, it narrowly misses on the 5.0 mark, but the fact that he gives you a Treasure Trove for doing nothing at all is a massive bonus. 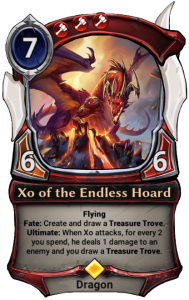 The fact that it’s a giant flyer that can draw you MORE cards and deal some extra damage in the event that a 6/6 isn’t enough is also a pretty damn good upside. 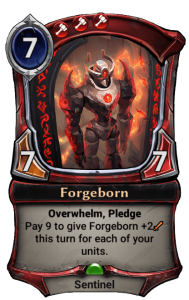 Even if you don’t get to 7 or FFF, you still get your card back from the Trove, meaning there’s almost zero risk to playing this expensive card. 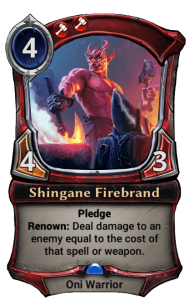 If you can ramp or reduce the cost of this guy, make sure you value him a little higher. It’s guaranteed card advantage, and a very powerful threat. The biggest drawback is obviously the 8 in the top left. 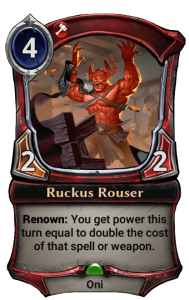 I think the first might make the cut on raw power in any non-aggro shell, but if you’re a ramp deck, you could play 2 or 3. 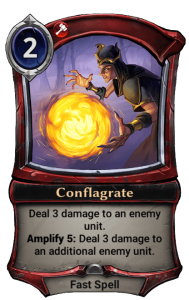 There is a common Argenport ramp spell for 2 in the set, which makes me like this in FJS (ambition) as well as in FTP (instinct). 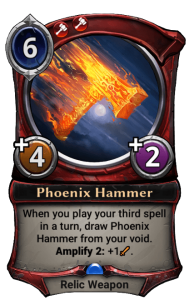 Fire gets some nice aggressive tools that can scale into the late-game, which I like. 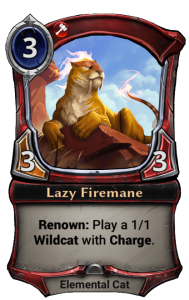 Things like Firemane Lioness and Hardsight Cyclops are exactly the kinds of things that an aggressive faction needs, since they are fine plays on curve, but can also help you close a game that has stalled out. 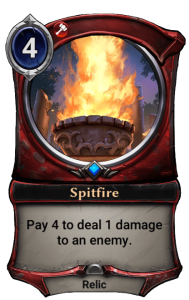 I do worry for Fire’s removal, as there’s only a single (good) direct kill spell at common or uncommon, so you’ll need to look to other factions (or multifaction cards) to really solidify your removal suite.